The Rangers are back on home ice, looking to come away with a win in a very important Game 5, and move to within one game of advancing. Photo courtesy of MSG Photos. What a difference Friday’s 5-1 win at Amalie Arena makes in the series. Following a 6-2 loss and a 6-5 overtime loss in consecutive games, panic was widespread through Rangerstown about many facets of the Rangers game. Now, the series is tied at two games apiece, both teams have scored 14 goals in the series, and the Rangers get to play a crucial Game 5 on home ice tonight. Game 5 is always seen as one of the most important games in the series, especially when the series is tied like it is for the Rangers and the Lightning. The winner of tonight’s game has a huge advantage, needing to win just once in two games to advance to the Stanley Cup Finals. Tampa Bay gets to play Game 6 at Amalie Arena, and the Rangers would have the advantage in a potential Game 7 at Madison Square Garden. Needless to say, this game is very important. The Rangers performance in Game 4 was exactly the type of game that they needed. Henrik Lundqvist, after questioning himself following Game 3, had a magnificent 38 save performance. 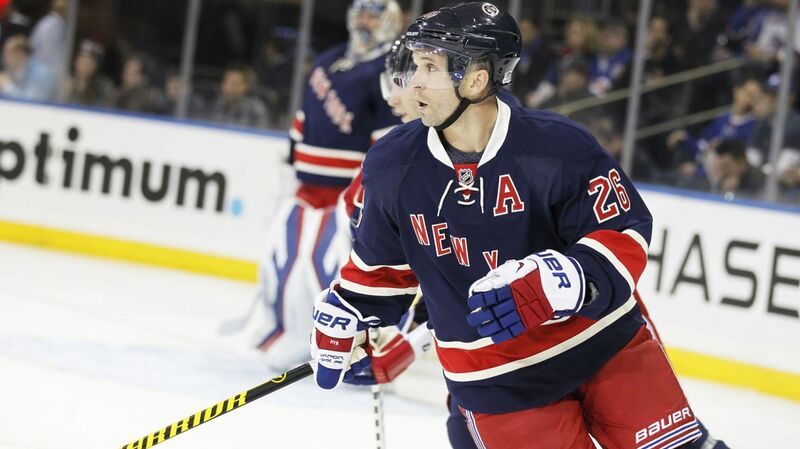 Rick Nash scored twice and had an assist, and Martin St. Louis scored his first goal of the playoffs. All of the guys that needed a big night had one. Henrik Lundqvist bounced back in Game 4, finishing with 38 saves to tie the series up coming into tonight’s game. Photo courtesy of MSG Photos. On the other hand, the Lightning had a very frustrating night. They outshot the Rangers, and probably had more possession, but could not score more than once, and missed on some great opportunities. It showed after the game, with the Lightning forwards agitated and aggressive near the end of the game. For all of the flak that Henrik Lundqvist caught, Ben Bishop hasn’t been much better in these last two games. He’s allowed 10 goals in the last two games, allowing five goals on 28 shots and 24 shots in the last two games, respectively. Figuring out how to score on Bishop is great for the Rangers, because he was a huge thorn into their side coming into this series. Bishop now faces a similar adversity that Lundqvist faced following Game 3, and needs to respond accordingly if Tampa wants to win. With all of the talk about the triplets, who have been outstanding in this series, Steven Stamkos and Alex Killorn, now dubbed “The Twins,” have been extremely important to Tampa Bay in this series. Stamkpos scored the lone goal in Game 4, and now has five points (3-2-5) over the course of his three game point streak. Killorn seems to get a few great chances in each game, and pressures Lundqvist more than every other player. He too has a three game point streak, with six points (3-3-6) in that span. Look out for these two tonight. Henrik Lundqvist had a great bounce back performance on Friday, making 38 saves and keeping the Rangers afloat in a third period where they were outplayed, but still managed to score twice. Lundqvist is the backbone of the team, and when the team plays better defensively in front of him, the result is better. He knows the importance of this game, and will be ready for the game tonight. Rick Nash and Rangers fans everywhere breathed a sigh of relief when he netted the first goal of the game, and then added another goal later, giving him four playoff goals this year. It was his first multi-goal playoff performance of his career. Nash has been great in the playoffs, but goal scoring was the one thing missing from his game. Hopefully he can continue his goal scoring and be a go-to-guy for the Rangers going forward. 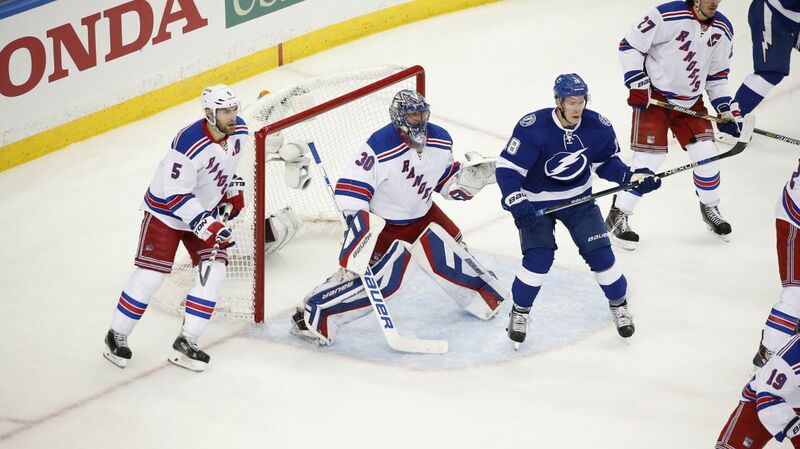 Martin St. Louis scored his first goal of the playoffs in Game 4, scoring the fourth goal of the game on the power play. He had his struggles, and one goal could be all he needed to get the ball rolling. After he scored, St. Louis looked like a completely different player, nearly scoring on two separate occasions after that. Martin St. Louis had some more pep in his step following his third period goal, and that could be exactly what he needed to regain some confidence. Photo courtesy of MSG Photos. That second wind was very evident. He’s been a streaky player throughout his career, so this goal could push him and motivate him to continue to produce, both at even strength and on the power play. The Rangers power play is finally becoming a weapon, with two goals on the man advantage in each of the last three games. In the last two games, their four power play goals have come on their last five shots, and they’re 6-13 (46.2%) in the last three games. Having a potent power play adds another dimension to the Rangers offense, and makes them more dangerous on the ice. 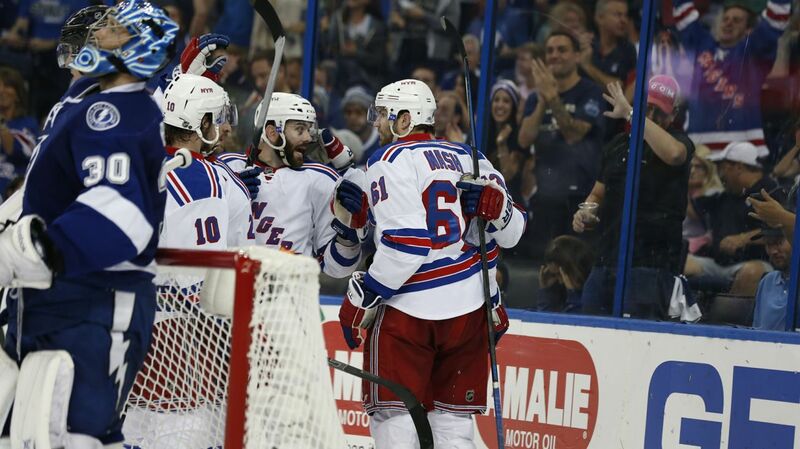 The Rangers and the Lightning will faceoff at Madison Square Garden at 8 PM. The game will be broadcasted on NBCSN. Posted on May 24, 2015, in Game Previews and tagged Alain Vigneault, Ben Bishop, Cam Talbot, Carl Hagelin, Chris Kreider, Dan Boyle, Dan Girardi, Derek Stepan, Derick Brassard, Dominic Moore, Hartford Wolf Pack, Henrik Lundqvist, James Sheppard, Jesper Fast, JT Miller, Keith Yandle, Kevin Hayes, Kevin Klein, King Henrik, Madison Square Garden, Marc Staal, Martin St. Louis, Mats Zuccarello, Matt Hunwick, MSG, MSL, New York Rangers, NHL, NHL 2014-2015 Season, NHL Playoffs, NY Rangers, NYR, Rangers, Rangers Nation, Rangerstown, Rick Nash, Ryan Bourque, Ryan McDonagh, Stanley Cup Playoffs, Steven Stamkos, Tampa Bay Lightning, Tanner Glass, The Ranger Zone, Tyler Johnson. Bookmark the permalink. Leave a comment.